(NewsUSA) - Sponsored News -As much as we all love having a healthy smile and gums, a new national survey reveals many U.S. adults miss the mark when it comes to caring for their teeth and gums, putting them at risk for periodontal disease, which affects one in every two adults over age 30. One of the biggest no-nos? Eating a snack at night after having already brushed your teeth, which one-third of those polled admitted to. 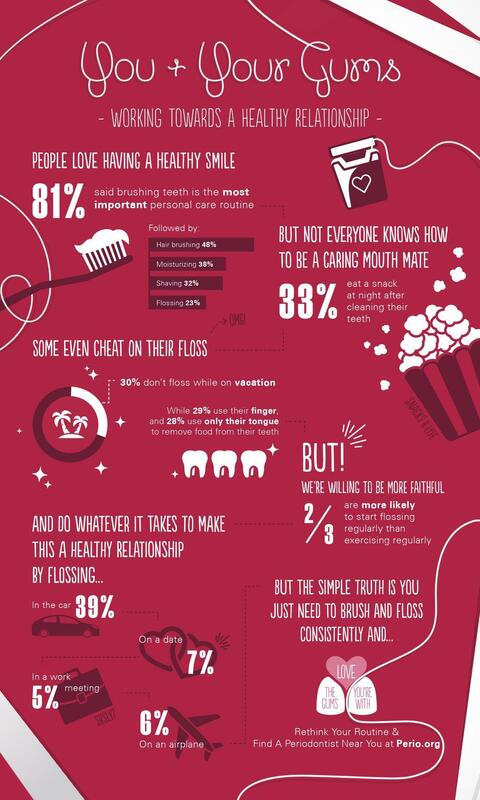 On the plus side, respondents show a willingness to floss more regularly - in fact, you'll be surprised at the odd places we admit to flossing. For healthy teeth and gums the American Academy of Periodontology (AAP) recommends brushing and flossing twice daily and regular visits to your periodontist for a comprehensive periodontal evaluation, and most importantly to Love The Gums You're With.